Tonight we learned to knit by watching a video on You-Tube. (thank-you knit67 with your English accent) How crazy is that? There is quite the disconnect in my mind about the whole thing. Knitting is a traditional, old fashioned thing , while You-Tube is part of the modern, wired world. To have these two things come together is a bit odd and a bit of a comment on the way the internet is a part of our everyday life. Anyway... emma decided she wanted to learn to knit. And I am first to admit my knitting skills are limited. I could never cast on, and somehow always ended up adding extra stitches to rows. Since she announced this after we had come home from Nani's house, it was up to me. The instruction booklet we had was of no help, so it was Google and you-tube that came to our rescue! 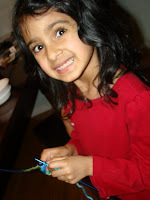 I"m pretty happy to report that our evening of knitting was fairly successful. We have two 3" square pieces of knitted something and some sore fingers to show for it. I find the pictures quite clear and it has supplies (except yarn). You can get it at Joann's or Michael's for around $15 I think. Otherwise, if you just keep going with youtube videos, that is good. 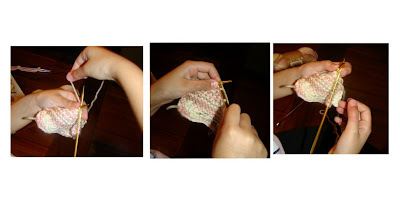 Ravelry.com is a great website to look at things you could knit. You can search by level and find something easy, generally a scarf or dishtowel or small baby blanket are good things to start with. Whatever it is keep it small and simple so you just continually are working on knitting and purling. Good luck and have fun! I'm still in awe that you can learn knitting from youtube! The girls look so cute. lol! Look at the concentration on Emma's face. Lauren, what a poser. ha! Very cool. I think knitting hats/touques would be a cool thing to learn...for you...not me. They seem easy and you could do a lot of fun colors.